This in-depth dashboards course will teach you how to build a custom Excel dashboard using professional data visualization techniques. By the end of the course, you will have a solid understanding of how to tell a story by combining data, charts, graphs, and other visuals. Who should take this Excel dashboards course? This Excel dashboards course should be taken by any type of financial analyst working in corporate finance. This includes financial planning & analysis (FP&A), corporate development, equity research, and investment banking. This data visualization course is designed for professionals who are responsible for presenting financial information to management and executives at their businesses. Anyone who wants to learn how to present clean, focused and impactful information will benefit from this course. This course will cover the basics of data visualization basics, then go over the theory and specific concepts that drive data visualization. You will learn how to develop effective storytelling techniques by utilizing the best selection, design, and presentation of charts and graphs. Finally, you’ll learn how to build the perfect chart and graphs to effectively communicate the story behind your data. 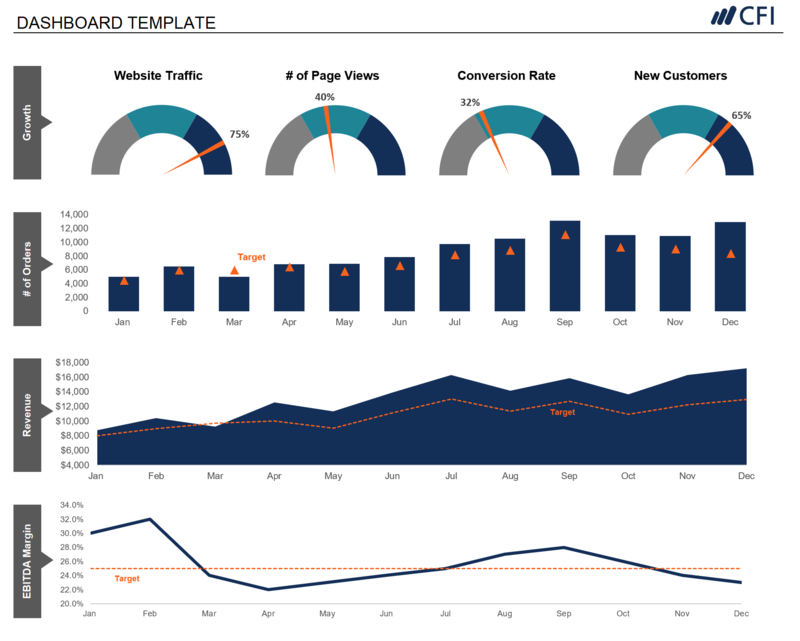 What will you learn in this dashboard & data visualization course? 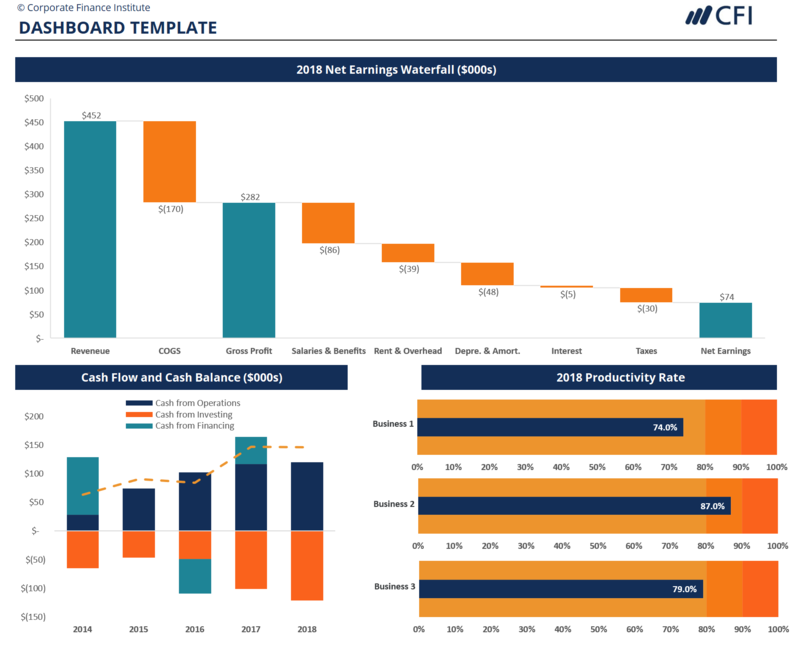 What's included in this dashboard & data visualization course? From the time I enrolled, I have really enjoyed learning this course. The lecture material is well thought out, the presenter is clear and his teaching method is immaculate. I have learned quite a lot on Dashboards and Data visualization, which will aid me throughout my career. For that, I am appreciative, as I am yet to find a course that offers you the knowledge that not only can you apply immediately (through real-life examples provided for practice) but also knowledge you actually retain. Thank you CFI team! This was my favorite of the core courses and I left it for last! 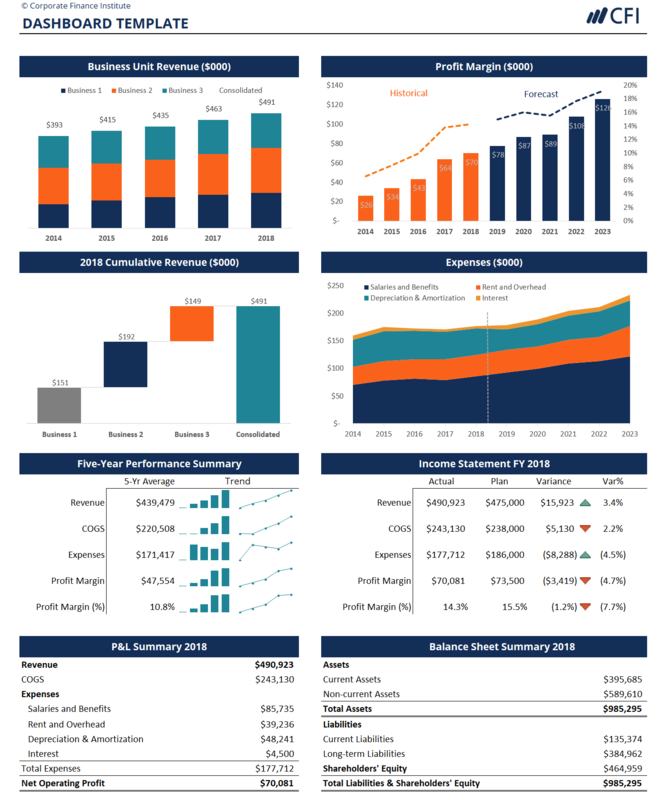 Excellent guidance on converting complex and intimidating spreadsheet information into beautiful, colorful graphics that are "accessible" to everyone and simple to digest! I love this course, the Dashboards were amazing. I took the exercises on my own to build one dashboard, it was very nice how the doughnut chart and pie chart (I call it a needle now), could just show percentages in an amazing data setting. I got my certificate and now have a good understanding of easy to apply data. Beautiful. Awesome tricks to customize charts and graphs! I really enjoy these CFI courses. The course covers a heat map as one of the useful tools for sensitivity analysis. However, it does not teach the steps to create such heat map. Can this content be added so that for those who do not already know how to automatically create a heat map can learn how to do so? CFI doesn't drop the ball once in their classes. Another great tutorial. This one, I particularly enjoyed the presentation and communication tips on capturing your audience. Also, loved the dashboard layout. Tim is a very good teacher as his explanations are so easy and understandable. Keep up the great work. A lot of good ideas in this course, although I don't necessarily agree with all the chart decisions. For example, other Data Viz courses/manuals I've used call for the use of grey for bars that shouldn't be the focal point (orange and grey instead of orange and blue). Excellent!!! Many skills to discover here that will make your financial analysis, sensitivity, information & communication, and reporting more professional in the finance industry. Thanks, CFI. This course is simply amazing. Honestly, it is the best course I have ever seen after 15+ years of experience. Thanks a lot.